ATLANTA -- Seeking to connect with black pastors from around the country and hear about their best practices, nine members of the Florida Annual Conference attended the 2013 Convocation for Pastors of Black Churches held Jan. 9-11. "We need to start appreciating each other's cultures and heritages and set aside our differences ..."
Besides Lewis, the Florida Conference was represented by Rev. Candace Lewis, recently promoted to a new church leadership role with the General Board of Discipleship in Nashville, Tenn.; Lamont Hogan, senior pastor at New Life in Jacksonville; Bill Bailey, senior pastor at Ebenezer, Jacksonville; Altheria Lenon, retired pastor from Zion, Ocala; Carolyn Thomas, senior pastor, Altoona; Juana Jordan, senior pastor at Harris Chapel in Fort Lauderdale; Kevin James, senior pastor, Palm Coast; and Mary Jackson, senior pastor at Freedom, Waldo, and Greater Bell, Brooker. Harold Lewis, who has been in Lakeland for four years, is a member of the Baltimore-Washington Conference. He came to Florida to help with new church development under the auspices of former Bishop Timothy Whitaker, described by Lewis as very encouraging to black pastors. Whitaker retired last summer. 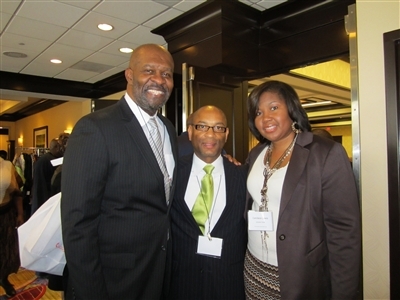 Vance P. Ross, left, design team chairman of the Pastors of Black Churches Convocation in Atlanta, with Harold Lewis and Candace Lewis of the Florida Conference. Photo by Anne Dukes. About 450 attendees gathered for the 2013 convocation, which has as its goal offering information, inspiration and encouragement to pastors of black churches and those who support them. Wednesday morning’s opening plenary’s speaker was Rev. Olu Brown, lead pastor of fast-growing Impact Church in Atlanta. Brown told a packed ballroom at the Atlanta Marriott Hotel about his church’s journey and shared insights on growth. Started in January 2007, Impact UMC began as a church plant with 25 attendees and has grown to 1,300 weekly, plus 400 who watch online, the pastor said. Immediate plans include moving to a much larger space of 76,000 square feet and 10 acres of land. One of the secrets to Impact’s growth, Brown said, has been the conscious decision to strive for an attendance that is better than the official membership roll. “Ask yourself, ‘Do we connect?’ and as you make connections with small groups of 25 or less, getting people involved and not necessarily just as members, you will also see membership go up,” he said. Lewis agreed that this approach has its appeal. “In these days of economic challenges, it’s possible to attract folks and move attendance rather than members by building a relationship with them,” he said. He also said that black churches can grow by being inclusive and relying on the connectional nature of the church, as well as other denominations. “We have to be part of the whole ecumenical body, and we have to work on race relations,” he said, citing the continuing separation of Anglo and black churches on Sundays. Despite the ongoing challenges, Lewis said he believes that by taking calculated risks, the church can bring people together. Later sessions at the convocation included such topics as pastors and health; dealing with conflict in a transformative way in the congregation; mediation skills; dealing with moral, spiritual, personal growth and development issues; and social media networking and communication.